Covering behaviour in sea urchins has been observed in many different species ranging from shallow and reef dwelling species to those that inhabit the deep sea. Studies have found ultraviolet (UV) radiation and protection from surge to be some of the most important factors that affect covering behaviour. This study explored the responses of Salmacis sphaeroides to novel items and to investigate what factors influence the degree of cover. S. sphaeroides were collected from North Stradbroke island (n=12) for use in experiments. 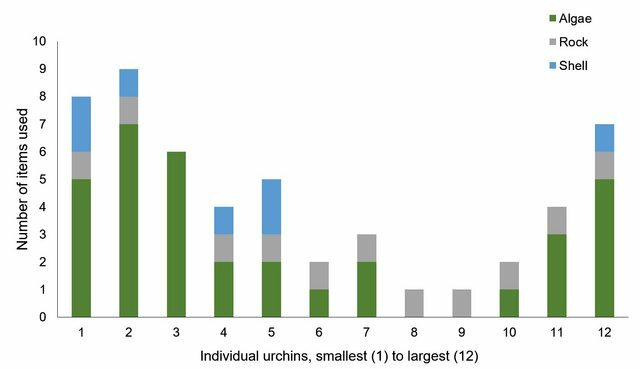 Covering behaviour was observed in all urchins, and size was found to to influence the degree of cover, with smaller urchins covering significantly more of their aboral surface than larger urchins. Urchins reacted to novel items such as rocks and plastic by integrating them into cover, although some urchins attempted to consume plastics. This unexpected behaviour may have greater implications and warrants further study as the effects of plastic waste on urchins are yet unknown. Sea urchins are ecologically important grazers found in marine habitats worldwide, and numerous species are known to display covering behaviour. This behaviour has been observed in both shallow and deep water species and across different families, though due to the diversity of species, the drivers for each species may differ (Pawson & Pawson 2013, Lees & Carter 1972). Items from the area around the urchin are picked up using tube feet and positioned on the aboral surface using both tube feet and spines, and tend to vary based on species, habitat, and individual (Kehas et al. 2005, Sigg et al. 2007). Many factors such as ultraviolet (UV) radiation, food storage, ballast, and protection have been proposed as drivers of the behaviour, although their importance and role is still debated (Kehas et al. 2005, James 2000, Dumont 2007, Crook 2003, Lees & Carter 1972). One of the most widely studied drivers of covering behaviour in echinoids is UV radiation. Many studies have pinpointed exposure to UVA and UVB wavelengths as a strong stimulator of covering in various species (Adams 2001, Sigg et al 2007). Adams (2001) found that urchins exposed to UV wavelengths covered faster and more to those exposed to only photosynthetically available radiation (PAR). Sigg et al (2007) noted that urchins used more covering material and covered larger areas of their test when exposed to UV. Covering behaviour has been shown to increase with exposure to light in many species, in some cases being absent or greatly reduced in darkness, suggesting that many species of urchins cover in response to light (Adams 2001, Crook 1999). Further, in a study by Dumont et al. (2007), urchins sampled from deeper water (15m) tended to cover themselves less than those from shallower water (2m) in both light and dark conditions, suggesting that behavioural adaptations were different depending on depth, possibly due to less light penetrating deeper water. By covering the aboral surfaces, urchins may be able to reduce the amount of damaging UV radiation that is absorbed, and this may be particularly important in shallow water species that are exposed to greater amounts of radiation (Dumont et al. 2007). While covering materials may vary with habitat, there are some species specific trends that have been observed. Variation in item preference between two sympatric species was demonstrated by Amato et al. (2008), who demonstrated that two species of sea urchin showed clear preference of covering materials with one preferring to cover with rocks and the other with macroalgae. Despite occurring in the same area, species may be differentially adapted to environmental conditions, leading to a preference for different covering materials (Amato et al. 2008). Abiotic conditions such as surge intensity and contact with environmental elements have also been linked to increased covering behaviour; urchins covered more when exposed to rougher conditions and when there was more contact with algal fronds (Dumont et al. 2007, James 2000). Covering in these circumstances is thought to provide some measure of protection against physical damage, it has only been examined in a handful of species (James 2000). Salmacis sphaeroides is a species of urchin that can be found in shallow seagrass habitats in warm Indo-Pacific waters from Australia up to China and Hawaii (Humann & DeLoach 2010). In Brisbane, these urchins can commonly be found inhabiting seagrass meadows in the Moreton Bay area, and are known to exhibit covering behaviour (Belleza et al 2012). S. sphaeroides has been shown to be a voracious grazer of fouling macroalgae, proving to be an important control agent in mariculture studies (Ng et al. 2014, Toh et al. 2013). Despite being abundant, their behaviour and mechanisms for covering remain poorly studied. This study examines the covering behaviour of S. sphaeroides in both field and laboratory conditions, as well as the reactions of individuals to novel items and plastics. Salmacis sphaeroides (test diameter 6.68 ± 1.19cm) were collected by hand in May 2016 while snorkeling on North Stradbroke Island, from a patch of Cymodocea serrulata off Amity Point. Field data were collected in the same area, and 10 individuals of various sizes were collected for testing, with these individuals not included in the field data counts. Data on the covering materials used in the wild was recorded (n=35). Animals were housed in the Degnan Laboratory aquariums pending experimentation and fed with Caulerpa cupressoides and dried nori seaweed. Testing was done at one week intervals over the course of a month to prevent unnecessary stress. All animals survived and were returned to their original location at the end of the experiment. A total of 12 individual sea urchins were used in the experiments, 10 individuals collected from North Stradbroke and 2 from the laboratory. 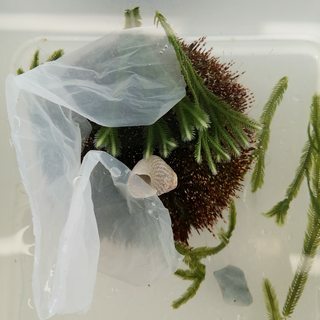 Due to lack of availability of seagrass, C. cupressoides was used as a substitute as urchins were demonstrated to use it as covering material in a pilot study. Urchins were removed from housing aquarium and placed in clear plastic tanks with enough seawater to cover the urchin, with at least one cm of water above the urchin. All urchins were allowed to feed and acclimatise to tanks for at least ten minutes prior to the start of the experiment. On commencement, all food items were removed from the tanks and ten pieces of C. cupressoides and three shell fragments (1.92 ± 0.44cm) were introduced. These items were kept within reach (approximately 1cm) of the urchin for the duration of the experiment but not physically placed on the urchin. Sea urchins were observed for 75 minutes, after which materials used to cover themselves were recorded for each individual. An item was determined to have been used to cover if it was raised past the midpoint of the animal onto the aboral surface. Chi-squared analysis was used to determine if behaviour in the lab differed significantly from field observations. To examine the response of S. sphaeroides to novel items, an experiment was set up using a small aquarium rock to as a novel item. The substrate where urchins were gathered from consisted of fine sand and seagrass, rocks were rare and not observed to be used to cover with. Tanks were set up as per methods outlined in experiment one. At the start of the experiment, all food items were removed and ten pieces of C. cupressoides, three shell fragments (1.92 ± 0.44cm), and one aquarium rock (2.20 ± 0.42cm, 2.30 ± 0.80g) were introduced to the tank. These items were kept within reach of the urchin for the duration of the experiment but not physically placed on the urchin. For statistical analysis, urchins were divided into three size classes based on test diameter, ≤64mm (small), 64-70mm (medium), and ≥70mm (large). Each class had four urchins. Sea urchins were observed for 75 minutes, and data was collected for each individual urchin. Cover was estimated visually by observing the urchin from directly above it and determining how much of the visible test was covered. Sea urchins were haphazardly allocated to treatments with four urchins in each treatment. Urchins were observed for 75 minutes and all items used to cover and behavioural observations were recorded. Field observations on covering preferences of Salmacis sphaeroides were gathered following specimen collection. Of thirty five urchins surveyed, all were covered with blades of Cymodocea serrulata, seven individuals were covered with C. serrulata and leaves, seven were covered with C. serrulata and shells, and one individual was covered with all three items. Most individuals were extensively covered, although urchins that used shells as part of their cover were not observed to carry more than three shell pieces. North Stradbroke Island showing covering behaviour. With the exception of one individual, all urchins had covered themselves by the end of the experiment. All urchins that were covered had picked up the algae fronds, while seven individuals had also picked up shells. The difference between field and laboratory observations was not significant (Χ2=5.6533, p = 0.05921). All urchins picked up the aquarium rock, although one individual dropped it towards the end of the experimental period. Most urchins began covering behaviour within ten minutes, only two individuals remained uncovered for 35 and 62 minutes respectively. The order of items picked up varied greatly, five individuals picked up algae first, six picked up the rock first, and only one picked up shells first. Most urchins were observed to use multiple items to cover themselves (4.4 ± 2.7) (Figure 2). 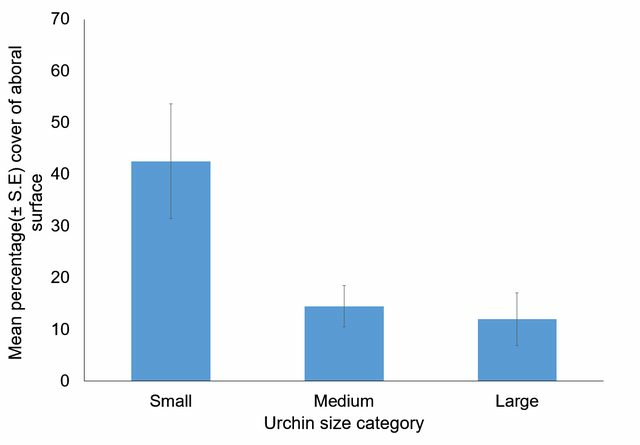 Small urchins covered more of their aboral surface compared to medium and large urchins, covering on average 42.5% of the test compared to 14.5% and 12% for medium and large urchins respectively (Figure 3). The relationship between size and surface covered was significant (Kruskal-Wallis: H = 15.826, p = 0.006). Figure 2. Number of covering items used and item preference for individual S. sphaeroides. Sizes increase from left to right. Figure 3. Mean percent of aboral surface covered for three size classes of urchins. In choice treatments, urchins presented with plastic all used it as part of their covering in addition to the more typical algae and shells. Response was rapid, with urchins reacting to plastic and bringing it to their aboral surfaces within fifteen minutes (Figure 4). In no choice treatments, urchins reacted differently; all urchins first attempted to consume the plastic by dragging it to the oral surface and to their mouths. Of the four urchins, three eventually gave up on attempts to consume the plastic, moving the strips onto their aboral surface and covering themselves with it, while one continued attempts to consume plastic without using it as covering material (Figure 5). period showing covering behaviour using algae, shells, and plastic. Salmacis sphaeroides displayed covering behaviour in both field conditions and laboratory studies, selecting items from their environment and using some to cover themselves. In field observations, urchins were observed to cover themselves with Cymodocea serrulata leaves, tree leaves, and shells, though use of seagrass leaves was most common. Leaves used to cover were most likely washed down from mangroves or dropped by trees close to the water, and low rates of use as covering material were most likely due to low availability. Shell distribution was patchy and centered around burrows of predators, though their low use as covering material is still unclear. Covering behaviour under laboratory conditions was not significantly different from field observations, however, leaves were not used in laboratory tests and may have had differing results. The effect of size on area of the test covered was highly significant, supporting the findings of previous studies that smaller urchins were covered more of their aboral surface than their larger counterparts (Crook 2003, Dumont 2007). This suggests that smaller urchins may be affected by environmental factors differently or that there are other behavioural differences affecting covering behaviour. The difference for increased covering in smaller individuals may be due to increased vulnerability to predators or environmental factors at that size,prompting smaller urchins to attempt to appear more cryptic or inaccessible (Crook 2003, Dumont 2007). When the novel item, an aquarium rock, was introduced, all urchins interacted with it and used it as part of their cover. 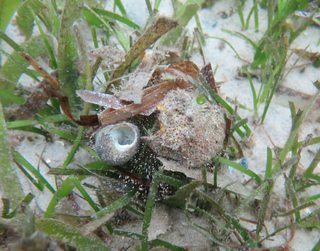 Small rocks or rubble pieces are uncommon in the seagrass habitats where S. sphaeroides specimens were collected, so the strong preference for rocks as covering material suggests that rocks may be a better choice for covering if they were found in the habitat. Covering behaviour is thought to have costs associated with it, and animals are believed to exhibit some measure of choice based on the costs associated with the object (Crook 2003, Sigg 2007). Similarly, nearly all urchins presented with a plastic strip chose to cover themselves with it. Those given only the plastic first tried to eat it, while those presented with plastic in addition to other objects did not bring the plastic to their mouth, consuming algae fronds instead. The attempts to consume plastic may be due to lack of immediately available food as urchins were observed to eat some of the algae during other tests, or simply due to them failing to initially recognise it as a non food item. As pollution and the amount of anthropogenic waste in oceans increases, it may have severe ecological effects on various species. Urchins have previously been shown to react negatively to increasing water temperature, decreasing the amount of cover and rendering them more vulnerable to radiation and damage (Brothers & McClintock 2015). The effects of plastic consumption on S. sphaeroides have not been studied, but may have negative impacts to the ecosystem due to their importance as grazers. Further research into the effects of introduced plastics and plastic consumption in sea urchin species may aid in conservation efforts. The responses of S. sphaeroides to light were not explored in this study, although light and UV radiation has been shown to affect the speed of covering behaviour, material choice, and area covered in other species of urchin (Adams 2001, Sigg 2007). As S. sphaeroides can commonly be found in shallow waters, a response to light is expected. Covering behaviour was observed in all individuals at the collection site, as well as in sympatric Tripneustes gratilla, suggesting that covering may be a response to light or UV radiation. Similarly, the effects of surge or wave action have been found to increase covering in some urchin species, but were not measured in this study (Lees & Carter 1972, Dumont et al. 2007). Due to the relatively calm nature of the seagrass meadows S. sphaeroides inhabits, surge may not play as important a role as light. Due to the limited sample size, conclusions drawn from this study may be limited. As there were only 12 urchins, the same individuals were used across all three experiments, which may have affected the results. While steps were taken to minimise the impact this might have had, repeating the experiments using more individuals may yield more accurate results. The covering behaviour or S. sphaeroides and other urchins is complex and driven by a host of different factors. The size of the individual and the materials available for covering have been demonstrated to affect the amount of cover and their preference for items. Further study into the mechanisms of this behaviour and the effects of anthropogenic disturbance will help further the knowledge of this field, allowing more effective conservation and ecological protection. Thank you Gawain and Luke Dekkers who came to Straddie with me for specimen collection and again to Luke for returning them. Thanks to the tutors Eunice, Tasha, Federico, and Jabin, as well as Anne Goldizen for advice, and most importantly Bernie and Sandie for advice, assistance and use of the aquariums. Adams, N. 2001, "UV radiation evokes negative phototaxis and covering behavior in the sea urchin Strongylocentrotus droebachiensis", Marine Ecology Progress Series, vol. 213, pp. 87-95. Amato, K.R., Emel, S.L., Lindgren, C.A., Sullan, K.M., Wright, P.R. & Gilbert, J.J. 2008, "Covering Behavior of Two Co-occurring Jamaican Sea Urchins: Differences in the Amount of Covering and Selection of Covering Material", Bulletin of Marine Science, vol. 82, no. 2, pp. 255-261. Belleza D.F.C., Abao R.S.A. Jr., Taguba C.A. & Dy D.T. 2012, “Effects of UV-C on the Masking Behavior of the Green urchin Salmacis sphaeroides (Linnaeus, 1758)”, The Philippine Scientist, vol. 49, pp 34–43. Brothers, C.J. & McClintock, J.B. 2015, "The effects of climate-induced elevated seawater temperature on the covering behavior, righting response, and Aristotle's lantern reflex of the sea urchin Lytechinus variegatus", Journal of Experimental Marine Biology and Ecology, vol. 467, pp. 33-38. Crook, A.C., Verling, E. & Barnes, D.K.A. 1999, "Comparative study of the covering reaction of the purple sea urchin, Paracentrotus lividus, under laboratory and field conditions", Journal of the Marine Biological Association of the United Kingdom, vol. 79, no. 6, pp. 1117-1121. Crook, A.C. 2003, "Individual Variation in the Covering Behaviour of the Shallow Water Sea Urchin Paracentrotus lividus", Marine Ecology, vol. 24, no. 4, pp. 275-287. Dumont, C.P., Drolet, D., Deschênes, I. & Himmelman, J.H. 2007, "Multiple factors explain the covering behaviour in the green sea urchin, Strongylocentrotus droebachiensis", Animal Behaviour, vol. 73, no. 6, pp. 979-986. Humann, P. & DeLoach, N. 2010, Reef creature identification: tropical Pacific, 1st edn, New World Publications, Jacksonville, Fla.
James, D.W. 2000, "Diet, movement, and covering behavior of the sea urchin Toxopneustes roseus in rhodolith beds in the Gulf of California, México", Marine Biology, vol. 137, no. 5, pp. 913-923. Kehas, A.J., Theoharides, K.A. & Gilbert, J.J. 2005, "Effect of sunlight intensity and albinism on the covering response of the Caribbean sea urchin Tripneustes ventricosus", Marine Biology, vol. 146, no. 6, pp. 1111-1117. Lees, D.C. & Carter, G.A. 1972, "The Covering Response to Surge, Sunlight, and Ultraviolet Light in Lytechinus Anamesus (Echinoidea)", Ecology, vol. 53, no. 6, pp. 1127-1133. Ng, C.S.L., Toh, T.C., Toh, K.B., Guest, J. & Chou, L.M. 2014, "Dietary habits of grazers influence their suitability as biological controls of fouling macroalgae in ex situ mariculture", Aquaculture Research, vol. 45, no. 11, pp. 1852-1860. Pawson, D.L. & Pawson, D.J. 2013, "Bathyal sea urchins of the Bahamas, with notes on covering behavior in deep sea echinoids (Echinodermata: Echinoidea)", Deep Sea Research Part II: Topical Studies in Oceanography, vol. 92, pp. 207. Sigg, J.E., Lloyd-Knight, K.M. & Boal, J.G. 2007, "UV radiation influences covering behaviour in the urchin Lytechinus variegatus", Journal of the Marine Biological Association of the United Kingdom, vol. 87, no. 5, pp. 1257-1261. Toh, T.C., Ng, C.S.L., Guest, J. & Chou, L.M. 2013, "Grazers improve health of coral juveniles in ex situ mariculture", Aquaculture, vol. 414-415, pp. 288-293.